When it comes to scathing, incisive and truly hilarious political satire, Armando Iannucci sits at the top of the heap, the master of masters. 2009’s “In the Loop,” a film about British and American pols and military folks trying to figure out whether to go to war or not and how to manage it, was my first exposure. It was so obsessively funny, I kept thinking who thought this stuff up? Well, he’s back and biting and entertaining as ever. The premise this time — take your seats — is the wackiness that might have ensued inside the Kremlin when dictator Josef Stalin died. Come on now, Steve Buscemi, Brooklyn accent and all, as Khrushchev. Is your appetite whetted? Well, it should be. One line zingers are ever present. There is physical slapstick. The ensemble cast is marvelous, portraying all your faves from that poli sci class in Soviet history. Beria. Molotov. Malenkov, Field Marshall Zhukov. 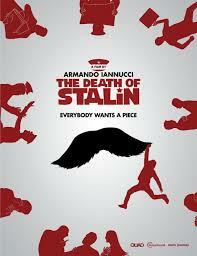 “The Death of Stalin” is wise. It is insightful. And it’s a hoot.